History: (What If? 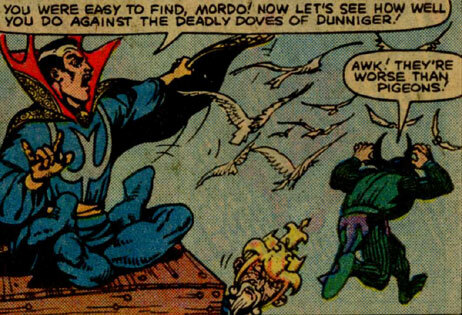 I#34/56) - When Baron Mordo attempted to saw the Ancient One in half, Doctor Strange arrived and pushed Mordo back using the Deadly Doves of Dunniger. Having a secret backup plan, Mordo summoned Dormammu, who demanded that Strange pick a card, any card. Comments: Created by Roger Stern and Marie Severin. This reality diverged when the Ancient One decided to teach stage magic, rather than actual mystic arts. The Ancient One was an ancient magic-user, teaching stage magic to both Baron Mordo and Doctor Strange. When Mordo tried to saw him in half, Strange came to the Ancient One's aid, banishing Mordo with the Deadly Doves of Dunniger. The Ancient One was presumably very skilled at stage magic. Baron Mordo was a student of the Ancient One who tried to use his stage magic talents to evil ends, such as sawing the Ancient One in half. 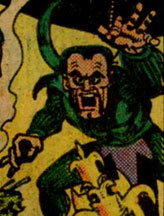 Despite invoking the Hoary Hosts of Houdini, Mordo was banished by the Ancient One's other student, Doctor Strange. In retaliation, Mordo summoned Dormammu, who demanded that Strange pick a card. Mordo was a skilled stage magician. Doctor Strange was a student of the Ancient One, trained in stage magic. When the Ancient One's other student, Baron Mordo, tried to saw the Ancient One in half, Strange banished him with the Deadly Doves of Dunniger. Mordo then summoned Dormammu, who demanded that Strange pick a card. 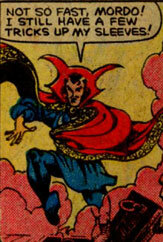 Doctor Strange was a very skilled stage magician. 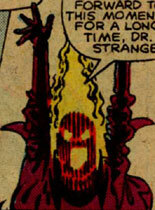 Dormammu was the Faltine leader of another dimension. He was summoned by Baron Mordo to battle Doctor Strange. As his first trick, he demanded that Strange pick a card, any card. Dormammu was an extremely skilled stage magician.